Poutine, Mounties, canoes and universal health care: These are just a few things that have, over time, become synonymous with this country. But how did they attain such iconic status? Symbols of Canada, a new collection of essays and photography, gathers the origin stories of 22 objects, concepts and key moments in Canadian culture. 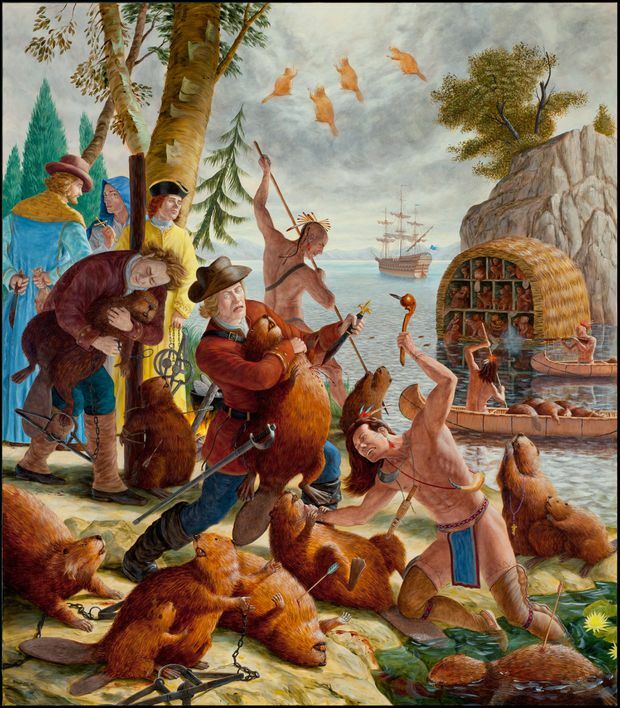 Here, Colin M. Coates, a professor of Canadian studies and history at Glendon College, York University, looks to the artist Kent Monkman to help tell the tumultuous tale of the humble beaver. Can there be a more obvious symbol of Canada than the beaver? No other animal, except for humans, is credited with the creation of the country. (Historically, the cod fish might have had something to say, but no one is listening to it.) “The beaver makes everything,” said an Innu hunter to Jesuit missionary Paul Le Jeune in the seventeenth century: Its valuable pelt could be traded for whatever people desired. Maybe the beaver could even make Canada. Economic historian Harold Innis ascribed the geography of the Canadian state to the fur trade that moved west and north across the northern half of North America between roughly 1600 and 1850. (To be precise, he was writing before Newfoundland joined Canada). Since 1975, the beaver has even been an official symbol of Canada, though its route to that lofty position bears examination. No less an authority than Joe (“I am Canadian”), speaking on behalf of Molson’s Canadian beer, assured television watchers that “the beaver is a truly noble animal." Cree artist Kent Monkman captures the ambiguity of the beaver as a national symbol in his 2016 painting Les Castors du Roi. But Cree artist Kent Monkman captured the essence of the ambiguity of the beaver as a national symbol. In a parody of, and ironic commentary on, different genres of art, Monkman’s 2016 painting Les Castors du Roi riffs off relevant images, including fanciful historical depictions, of the beaver. French and Indigenous hunters savagely murder the beaver with spears, daggers, leg-hold traps and guns, while church representatives stand idly by. On the right of the canvas, an anthropomorphized beaver prays to a Christian God, while beaver spirits ascend toward heaven. Few urban Canadians today have ever seen a beaver. But the beaver warrants recognition, many Canadians have agreed, because it exemplifies a number of admirable human qualities, such as industriousness, technical expertise and foresight. In its actions, it might even embody an aspiration toward what the Canadian Constitution refers to as “peace, order and good government.” The 1975 proposal to designate the beaver a national symbol allowed Canadians to debate issues of national identity in a largely playful fashion and to reaffirm some fairly vague national characteristics. The beaver has uncontestably played a key role in the historical development of the country we know today. Unfortunately, from its point of view, it had to give its life to create Canada. Adapted from Symbols of Canada (Between The Lines), edited by Michael Dawson, Catherine Gidney and Donald Wright.